Everyone agrees that a good night's sleep is vital, not only for your health, but to provide you with the energy needed every day. You don’t want to see me after a restless night. Imagine The Walking Dead… but taller. You get the idea. Sleeping on a plane isn’t easy at the best of times. Drifting off to dreamland in an upright position is downright unnatural, and then there’s the distracting noises and lights. Fortunately, there is something you can do to help make sleeping on a plane easier and more enjoyable. A simple starting point is wearing a sleep mask. The human body is amazing. It has evolved to harmonise its rhythms with the earth’s cycles. That means when the sun goes down, and darkness ensues, our bodies know it’s time to rest. In the modern era night is anything but dark. Blue toned light cast by televisions, phones, laptops and more can trick the brain into thinking it’s daytime. Our brain’s “biological clock” is positioned very close to the optic nerves and any light from our eyes interferes with its behaviour. Most importantly, light signals can inhibit the production of melatonin, the hormone responsible for making you drowsy. Short version: light bad, dark good. Why I choose the TEMPUR Sleep Mask? TEMPUR are best known for their innovative mattresses, made from a material developed by NASA in the 1970s. It’s different to generic memory foam because TEMPUR material springs back to shape time and time again. The same unique technology is used in their sleep mask to help it comfortably conform to your facial contours. A sleep mask may seem like a simple product at first glance, but there’s a big difference between imitators and the real McCoy. The plump pillow front is very comfy. Probably the most important factor when choosing a sleep mask. 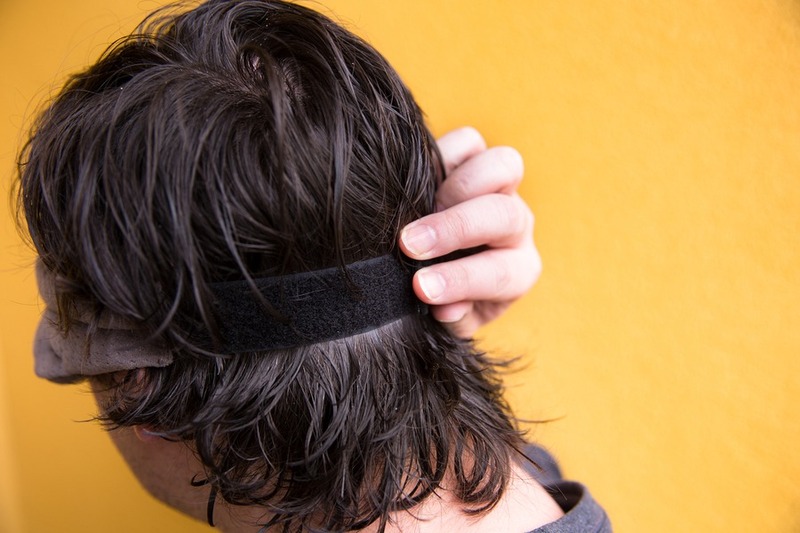 Strong Velcro straps wrap around your head to keep the mask snuggly in place. The elasticized Velcro strap ensures the mask fits almost every head size (even my big melon!). Complete darkness – this mask blocks all light out for uninterrupted rest. The nose gap will fit any size nose as the foam on each side of the gap contours to your cheeks, preventing light from slipping in. Plush foam padding gives you the option to rest the mask on your cheeks to allow easy blinking and no pressure on your eye balls. Or if you move up the mask, the padding can gently rest on your eyes to keep them closed. Both options result in no light leaking in. TEMPUR foam stays cool even after hours of use, and lets your skin breath. Soft velour covering feels very comfortable on your face. Even better, it does not leave embarrassing creases after it’s removed. Lightweight – this mask does not add uncomfortable pressure to your head. The feather weight also won’t make a dent on your carry-on weight allowance. Other users have said the mask even significantly reduces wrinkles around the eyes. I fortunately don’t have a lot of wrinkles (yet) to test that concept. But it sounds promising. 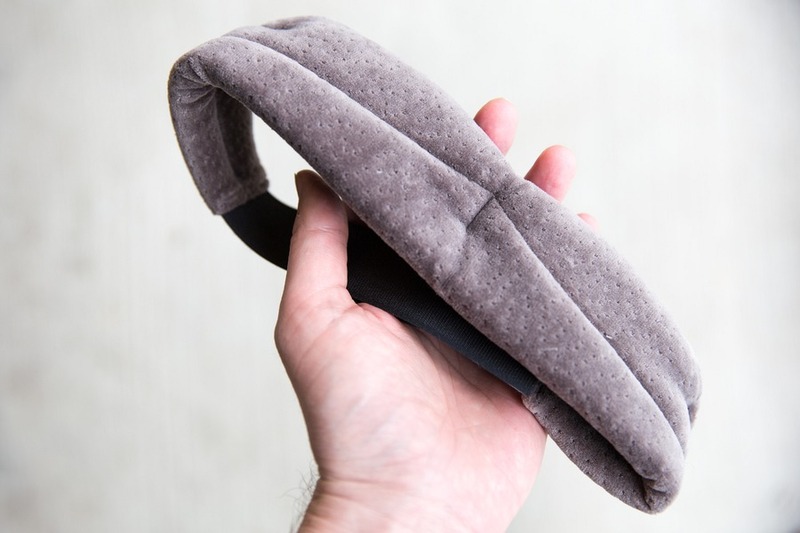 This really is the take-it-anywhere sleep mask – use it on a plane, train, car, hotel room or even at home. Keep one by the bed and one for travel. There aren’t a lot of downsides to this sleep mask. While alternative sleep masks may be thinner, they don’t offer the same level of darkness, comfort and support. The TEMPUR Sleep Mask does cover your ears but is not designed to reduce noise. So, if you’re a light sleeper, ear plugs can still help, especially while flying. If you use the mask on a daily basis you’ll probably find the soft material can absorb oil from your skin. With that in mind, it’s important to lightly sponge-clean routinely – if you choose the use the mask daily, then about as often as you’d wash your bed sheets. 1. Choose a window seat so you can lean against the side of the cabin. If fellow passengers in your row are getting up to visit the bathroom, they won’t bother you. 2. Wear relaxed, comfortable clothing. I’ve seen sweatpants on flights and while that’s a little too casual for my style, whatever works for you is fine. 3. Wear compression socks. This will improve blood circulation and reduce swelling in your feet during and after the flight. 4. Don’t cross your legs. The pressure inhibits blood flow and can contribute to deep vein thrombosis. In addition, the imbalance in leg positioning can apply extra strain on your lower back causing discomfort and pain. Keep your legs straight with a slight bend in the knees. If you can score an exit row on the plane, even better! 5. Lean back if possible (without being a jerk to the passenger behind you). This will reduce pressure on your lower back. If you have to sit upright, try placing a rolled-up jacket or travel pillow in the curve of your back to provide extra lumbar support. 6. Stretch beforehand. While waiting at the airport gate, stretch your leg and back muscles and if you’re adventurous try a few yoga poses. With limber muscles, you’re less likely to wake up feeling stiff after a long snooze. 7. Rather than placing your neck pillow behind your head, flip it and place it under your chin. It’s a more natural position for your neck and spine. 8. Turn off all lights – this includes built-in screens on seat backs. Studies show the blue light emitted by electronic devices such as phones, tablets and laptops mess with the natural circadian rhythms and disturbs your body’s production of melatonin. 9. Listen to relaxing music or white noise on noise cancelling headphones. If you really need to block out crying children (hopefully not your own), add ear plugs to the mix. 10. Avoid sugar and caffeine. These ingredients will increase your heart rate and make it harder to sleep. A carbohydrate-rich snack 1 hour before naptime is ideal. 11. Adjust your sleep patterns ahead of time (the night before). If you’re flying east, try going to sleep 30-60 minutes earlier. If you’re flying west, stay up an extra 30-60 minutes past your usual bedtime. Alternatively, you can just stay up late the night before so by the time you step onto the plane you’ll be almost asleep. Combining this with small doses of off-the-shelf melatonin supplements has been known to alleviate jet lag altogether. I used to scoff at the idea of wearing a sleep mask while flying. But having used one now for a while, I’m part of the choir. Sure, nothing can compare with sleeping in your own big comfy, soft bed, but I’ll take any help I can get when trying to sleep in squishy economy class seats. And the TEMPUR Sleep Mask might turn out to be your new best friend.